Most people love having beautiful well-designed homes. After all, the home is where the heart is. You spend time, money, and effort building your house from scratch to look and feel beautiful. The kitchen is no exception. Well planned kitchens with clean floors, sparkling countertops, and kitchen islands add to the beauty and design of your home. Kitchens are where most families spend maximum time apart from their bedrooms. Families and couples alike like to eat, chat, and catch up with each other in the kitchen or at the kitchen table. What happens when your kitchen bin looks shabby and starts smelling? Getting the right kitchen bin for your kitchen has become as essential as ensuring the correct water inlets are placed in the right places. Adequately getting your refuse and recycling in order is of extreme importance today. Smelly, unsafe, overfull, and dismal-looking kitchen bins that do not add to the aesthetic appeal of your kitchen can become a nuisance. These bins do not add value to your kitchen or your nose. Kitchen bins are a utilitarian item that can be made to look aesthetically beautiful. While some of the kitchen bins may be expensive, they are good quality products that serve all your garbage and refuse needs. Overflowing bins that stink, and are not sanitized regularly can become a health hazard as well. Some options might be costly in comparison to lesser priced versions, but you must consider the quality and shelf life of the kitchen bin before you decide on a cheaper option. With different modes that can make your daily life more comfortable, it is prudent to invest in a kitchen bin that will last longer than average ones. Most kitchen bins today come in a wide variety of styles and shapes. You might prefer a sleek one, a huge one to hold the refuse of your entire household, or one to cater to a small family. Whatever your need, we can help you choose the best bin for comfortable, modern, yet useful living. We understand your concerns. Most people are unsure of what their requirements are. Some modern features that you should be looking for are more attractive designs, higher quality materials, more comfortable waste handling, more extended warranty, a carrying handle, inner bag holder, foot pedal, stainless steel design, a hard plastic body that is easy to wipe, and so on. While you might not find all these features in a single bin, selecting a trash can that has most of these features and helps you with your daily refuse is an excellent way to start your selection process. Another critical thing to consider when buying a kitchen bin is the footprint that it might take up. Most houses today do not have a lot of space, and a large kitchen bin might not be ideal for a small to medium sized kitchen. Ideally, taller, more compact bins that fit comfortably into the nooks and crannies of your kitchen are better than heavy and bulky bins that might be difficult to move around. With advancements in technology awareness about recycling, you can also opt for a kitchen bin that helps segregate your refuse. Dual or multiple compartment bins help in sorting trash into recyclable, non-recyclable, compostable, paper, glass, and so on. If you have a large family and require more trash bins, you could opt for slim bins that are placed side by side with bright markers to sort out the trash. If you’re also interested in buying kitchen knives check out our review to make sure you purchase smart. Without further ado, let us look at some of the best kitchen bins for today’s homes. 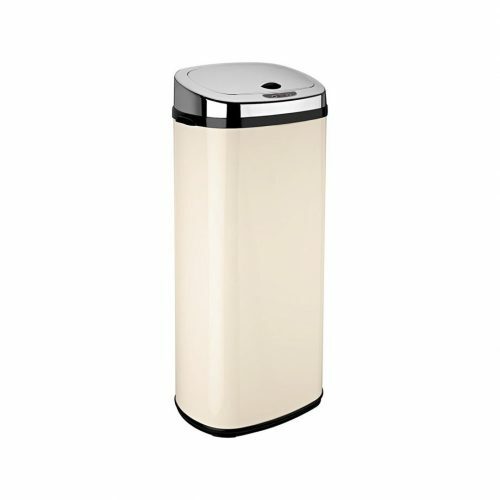 Joseph Joseph Intelligent Waste Totem Bin Removable divider and buckets, integrated odour filter. Joseph Joseph Intelligent Waste Titan Trash Compactor Hygienic compaction holds up to 3x more, odour filter. 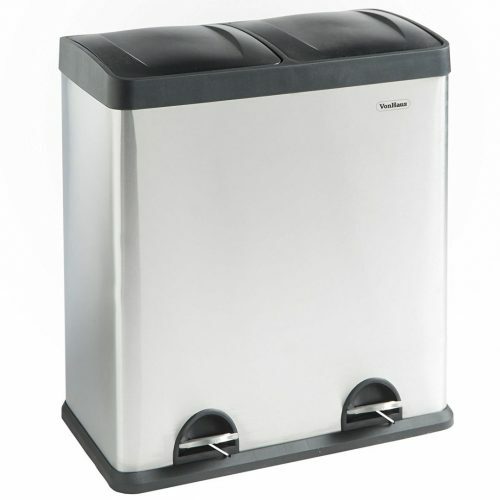 Simplehuman Dual Compartment with Pedal Bin Steel foot pedal, liner dispenser and silent close lid. 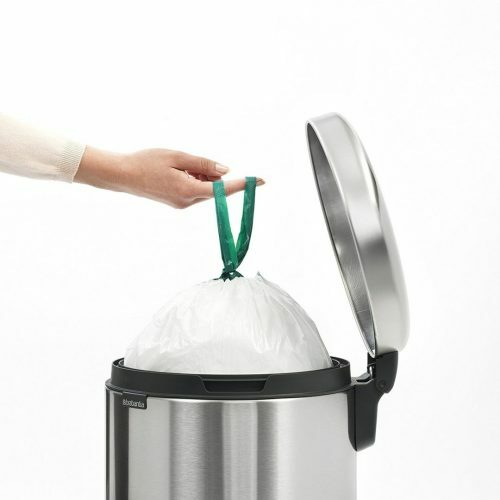 Brabantia Touch Bin with Plastic Inner Bucket Removable inner bucket, flat back, soft touch lid. 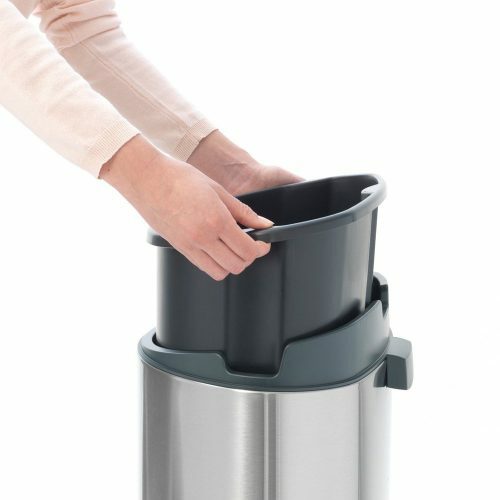 Brabantia Pedal Bin NewIcon with Plastic Inner Bucket< Removable bucket, multiple colours, supports ocean cleanup. VonHaus Recycling Bin with Lids Removable inner buckets with handles, dual foot pedals. 1home 58L Stainless Silver Steel Automatic Sensor Touchless Waste Bin Infrared sensor to open on wave, rolled lip to stop snagging. Dihl Rectangle Sensor Bin Infrared sensor to open on wave, multiple colours. 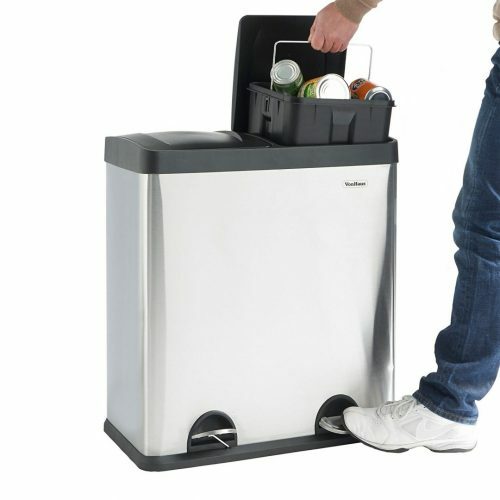 The best kitchen bin available today is the Joseph Joseph Intelligent Waste Totem Bin with multiple features and benefits. It comprises of a general waste compartment for every day refuse or recycling, a multipurpose drawer to separate different types of recyclables with hooks that allow you to fit two standard bin liners inside, removable inner buckets to empty the trash according to the requirement, and an integrated odor control filter inside the lid. Apart from these fantastic features, the Totem also comes with a removable food waste caddy that can be placed on the kitchen countertop while cooking. 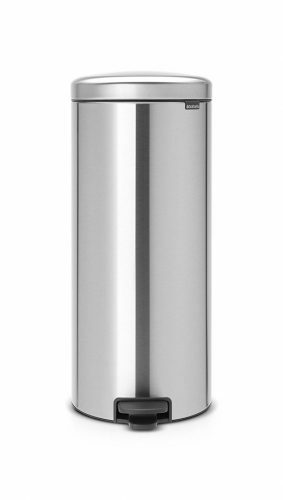 The Joseph Joseph Intelligent Waste Totem is available in four different finishes of stainless steel, graphite, silver, and stone. 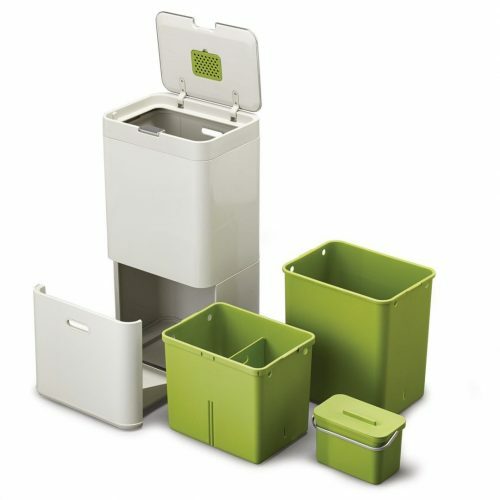 Incredibly stylish, user-friendly, and durable, the Totem has 2-3 compartments with a food waste caddy for ease of use. You can use the regular black bin liners or the biodegradable ones. In case you purchase the more massive sized bin liners, you can hook them on the sides. One of the best kitchen bins available today is the Joseph Joseph Intelligent Waste Titan Compactor. Slightly on the expensive side, the Intelligent Waste Titan lives up to its name. With a capacity of 90 liters after getting full, the stainless steel Titan can pack in 3 times more waste than standard kitchen bins. This model has a unique feature that allows refuse to get compacted. The Titan Trash Compactor maximizes the output every time it gets full. 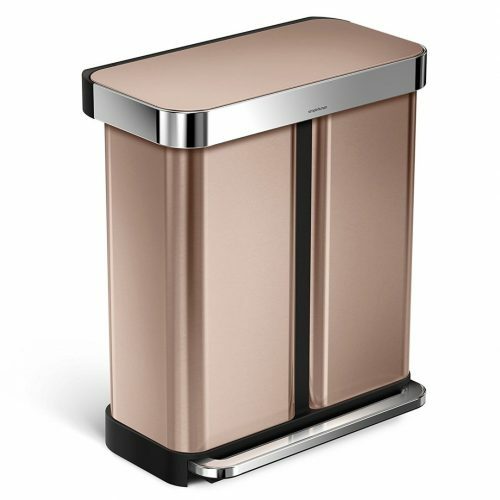 With new innovative technology, the Joseph Joseph Titan Trash Compactor is entirely hygienic and mess – free. It has advanced plates on the inside of the container that compact the trash to ensure only the inner liner of the trash can is in use. This innovation leaves your hands feeling clean and tidy. Another remarkable feature of the Titan Trash Compactor is the anti-tear design. The engineering is unique such that the liners of the bin do not tear, stretch or get pinched. While this bin is compatible with standard bin liners of the plastic variety, custom-fit IW4 extra sturdy bin liners add to the strength of the Titan and give a cleaner and stronger effect to the refuse already compacted. 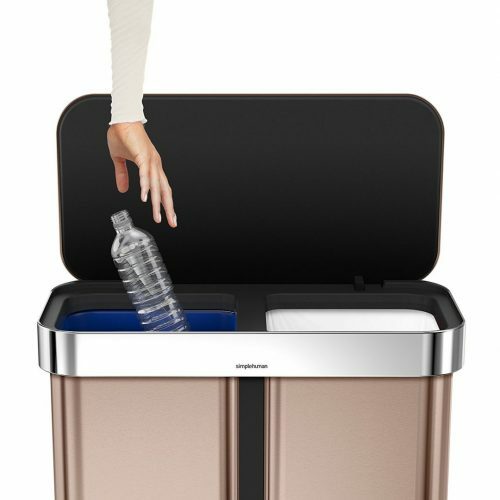 The fantastic dual compartment bin from Simplehuman is an L shaped rectangular marvel. With a stainless steel body, the double compartments make it easy to sort refuse into recyclable and non-recyclable halves. With an innovation that allows for an automatic liner dispenser change, the process of collecting and removing trash becomes a cleaner and more natural one. The other compartment comes with a removable recycling bucket that can be easily removed and emptied. The stainless steel liner rim is barely visible since it dips the bin edges to stay hidden from the eye. 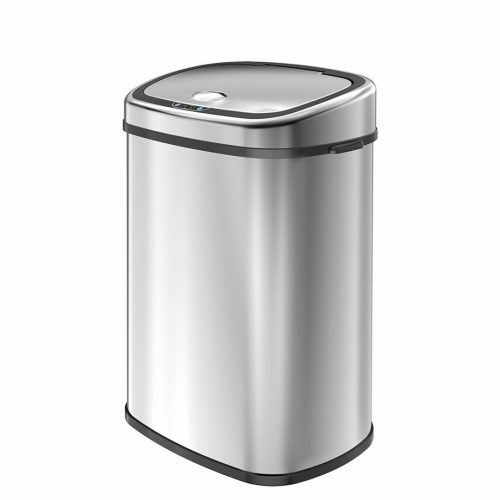 This model from Simplehuman comes with a sufficiently broad steel pedal and ensures a silent close each time the bin is opened. Another notable feature is that the finish is fingerprint proof allowing for a sleeker and more polished look without any smudges or marks. Easy to clean since it is stainless steel, this model should be high on the priority list. 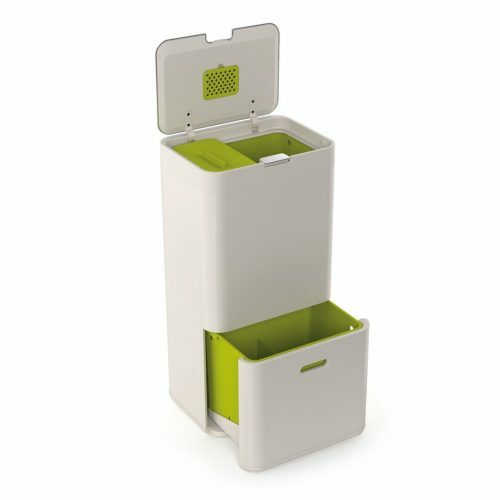 For people who love a neat and clean kitchen, the Brabantia Touch Bin is ideal. Completely silent, it operates with a soft touch opening. Easy to use and handle, the Touch Bin comes with an easily removable plastic inner bucket with a whopping 40 liters capacity. The body of the kitchen bin is made from corrosion-resistant and durable materials. 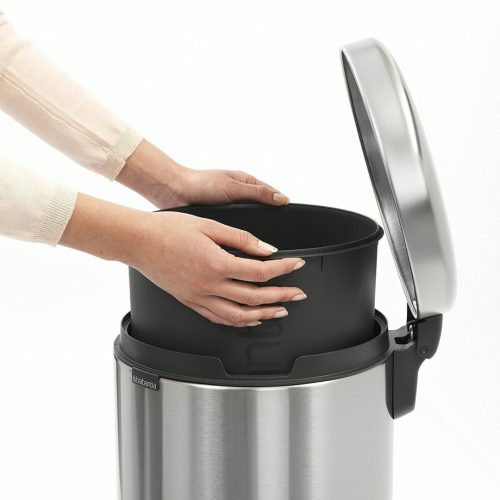 The Brabantia Touch Bin also comes with a removable stainless steel lid unit. This lid allows for easy removal of the plastic inner bucket to change the bin liners. This 40 liters model from Brabantia comes in a large size with a host of colors. According to the décor of your kitchen, you can choose from platinum, metallic grey, matte black, white, glossy black, steel (brilliant, matte, and glossy), and red. Another plus point to selecting the Brabantia Touch Bin with Plastic Inner Bucket is the ten year Brabantia guarantee. The Brabantia NewIcon is a more affordable model than the Brabantia Touch. Ranging in sizes, the largest available is 30 liters. 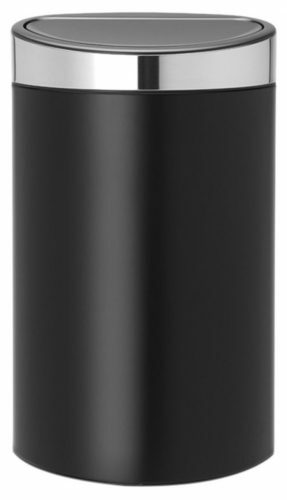 This bin is a matte black version with a satiny smooth finish that makes any room look classy. Sleek and compact, your kitchen is sure to get a new look. With a unique soft closing feature, the lid closes smoothly without any additional sounds or noises. Another noteworthy feature of purchasing this bin is that a part of the proceeds is forwarded to The Ocean Cleanup project. 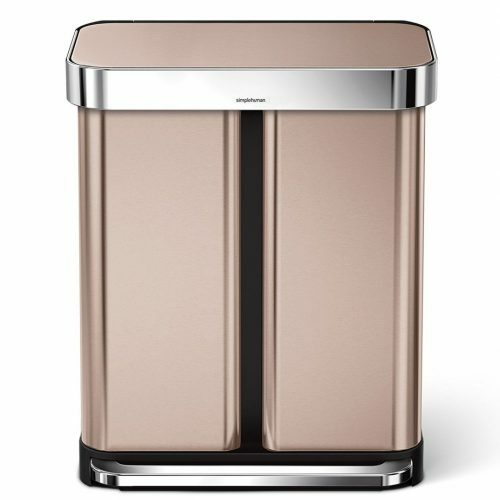 Available in multiple colors, the Brabantia NewIcon comes in pink, red, daisy yellow, brilliant and matte steel, matte and glossy black, mint, almond, and moss green. The removable inner bin bucket makes removal of refuse easy and quick. It has a foot operated pedal opening, a sturdy carry handle, and a protective floor ring. As with all Brabantia products, this model also comes with a 10-year product guarantee. Available in multiple sizes and colors, the NewIcon should be a must-have for your kitchen. 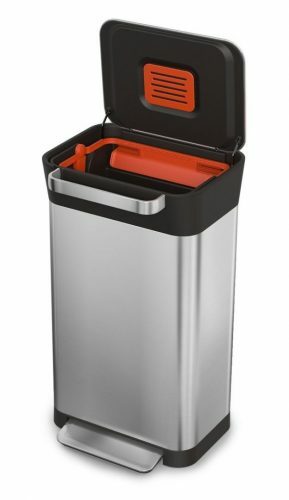 The VonHaus Recycling Bin with Lids is hugely space-efficient without being too heavy on the pocket. It has a 2 in 1 compartment design with a 36 liters capacity for refuse. It also comes with individual bins so that you can remove bin liners with ease. These separate bins also help decrease the time taken to segregate trash and recyclable rubbish efficiently. The removable inner plastic bins have sturdy chrome plated handles that minimize physical contact with the garbage. With color coded pedals in green and yellow to quickly identify the compartments, the VonHaus Recycling Bin has firmly shutting plastic lids that keep all odors at bay. This model from VonHaus also comes with recycling stickers that can be placed on top of the covers to make identification of compartments easy. It has a non-slip base and a satin finish that looks classy wherever placed. 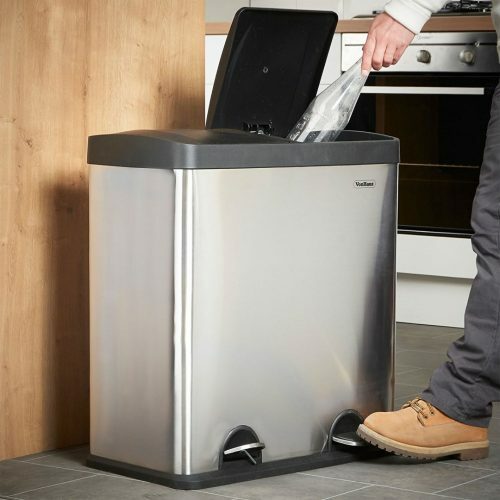 Easy to wipe because of its body, this bin can easily be fitted in any room. Removable buckets with handles for each. The futuristic design of the 1home has a touch-less advantage for people who like being neat and clean. This stainless steel model comes with an infrared sensor that automatically opens the motorized lid with a wave of the hand or proximity. It even comes with a 5-second LED countdown before re-shutting. 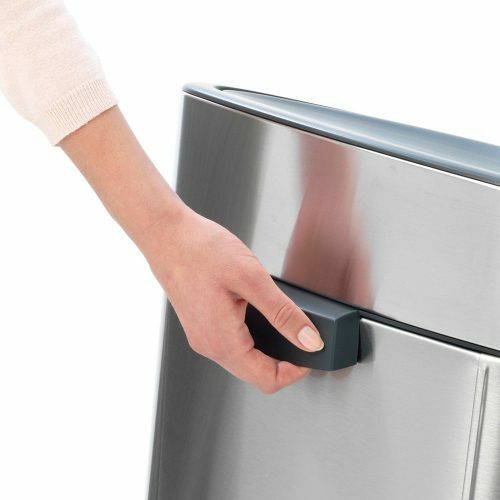 Another noteworthy feature of the 1home automatic sensor waste bin is the outwardly rolled lip at the rim of the opening that prevents bin bags from getting snagged and torn during disposal. This helps in preventing breakage of the bin bag due to friction from the edges. In case of a manual override, the 1home sensor model also comes with a button that keeps the lid open till you manually shut it again. 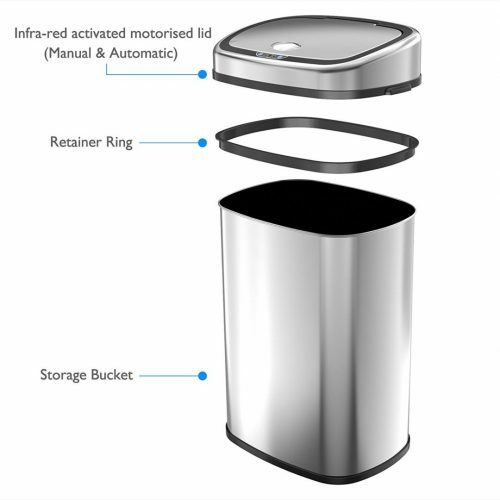 With a 58 liter capacity to hold garbage refuse, this bin has long-lasting battery life and works on 4 D-cell batteries. Lightweight, the chrome plastic body of this model is ideally suited for all kitchen types, designs, and décor. 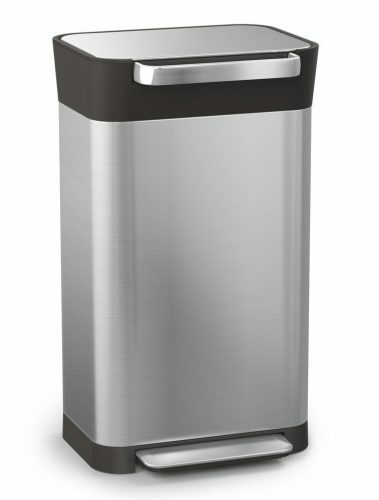 Similar to the 1home kitchen bin, this model from Dihl also comes with a motion sensor. All it requires is a wave of the hand to open the lid and empty the trash. 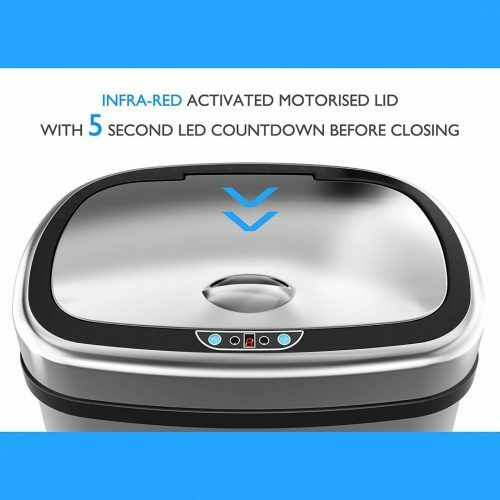 This automatic model is lesser in cost than the 1home Touchless Bin but does not have the LED features of a countdown. With a stainless steel body, the Dihl Rectangle has a lightweight plastic lid design with a mirror chrome finish. The stylish Dihl Sensor promotes hygiene since it enables scraping of food particles and waste from chopping boards directly into the bin due to the motion sensor. 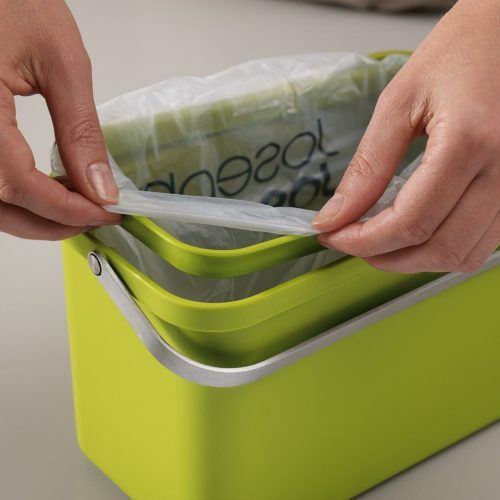 It does not have a removable plastic container like most other bins, but can easily be fitted with a 30-liter plastic bin bag since the size of the Dihl Sensor is 50 liters. This model also comes in volumes of 30 liters and 42 liters and colors like cream, purple, red, chrome, white, and black. With a user-friendly design and ease of garbage disposal, this model from Dihl can fit any kitchen to make it look neater and cleaner. The kitchen bin is one of the most essential things in the house. While not on our list of priorities, the kitchen bin soon takes precedence over several other things. While you have several options to choose from, making the right selection will help ease your kitchen woes for years to come. Assessing your daily refuse need and planning accordingly for the disposal can go a long way in ensuring you have a clean kitchen. There are many things to consider when making a choice. You can take stock of how many kilograms of garbage needs to be thrown out daily. Another way to assess your bin need is by space availability and whether or not you have any recycling requirements. Let us look at a few ways you can narrow your search for the perfect kitchen bin. Recycling helps each of us do our bit for the environment. Recycling-friendly bins are one of the best things that could happen to your kitchen. If you recycle regularly, you could consider a kitchen bin that allows you the ease of sorting your trash daily. Several 3-in-1 bins come with inbuilt compartments for glass, plastics, and food waste (including paper and metal). Minimizing the carbon footprint on the earth by recycling your daily refuse can help decrease landfills. Most recycling and trash cans come in metal or plastic. Depending on your generic daily trash, you can select either material. These are usually cheaper than metal ones. Lightweight and easy to clean, plastic cans are the usual choice. Dent-proof, these cans can get brittle with age, and crack. Hinges on the lid usually give way after heavy loads and may become a cause for inconvenience. Plastic kitchen bins are very versatile and can be used in other areas of the house including the bathroom, bedrooms, home office, and so on. Stainless steel bins are very classy looking and can fit with any décor and interiors that you have in the kitchen. If you have other stainless-steel electronic appliances in the kitchen, the stainless-steel bin will look fantastic. Metal bins are more expensive than plastic ones. Stainless steel metallic kitchen bins also run the risk of getting smudged or dirty very quickly. These bins also retain fingerprints quite often and can look dirty. Step-on metal bins with automated lids are great for kitchens that generate plenty of daily trash. However, if the requirement is not too high, a smaller sized metallic one with a manual top should also suffice. The durability of metal wholly depends on the thickness of the stainless steel from the manufacturer. Hence, it is essential to check the brand and reviews of the kitchen bin before purchase. If you are keen on buying a stainless-steel kitchen bin with a foot pedal, ensure that the foot pedal is equally strong; otherwise, there is a chance it might break off. Kids and senior citizens might find it difficult to operate the kitchen bin if the foot pedal gets damaged. Many people like to buy a specific type or form of kitchen bin. The basic shapes for kitchen trash cans are oval, half-round, round, rectangular, and square. Round shaped bins usually look great in bathrooms where you might have little extra space. Square shaped bins are usually easy to squeeze into small spaces between walls and cabinets. Most recycling bins are typically square or rectangular shaped to make room for additional compartments. Round cans with half compartments are not very space-friendly to hold trash and usually require emptying several times a day. Apart from conventional shapes, many people also like to select the width of the bin. Whether they prefer tall bins, short ones, slim ones, or wide-sized bins is entirely dependent on the availability of space in the kitchen or other rooms. If you have limited space, a tall bin would be ideal to fit all the refuse. Smelly bins can be the most significant deterrent in any kitchen. No one likes to walk past a bin that has a malodorous smell. Some trash cans come with standardized natural filters to absorb odors. Neutralizing filters have a film of charcoal with activated carbon on the inside of the lid to absorb bad odors and prevent smells from escaping the bin. These odor filters need to be replaced with store-bought filters so that the bin remains clean-smelling. If you trash can doesn’t come with an odor-filter, you can attach one or use a few coffee grounds or baking soda in your trash to eliminate odors.